This plugin allow you to go one a website when you right-click on a sign. /url <url> - Look at a sign when performing this command and all players who's made a right click on this sign will have this url in the chat whatever the text. EnableUpdater - [ true | false ] - Check and update the plugin at the server load/reload. SupportAuthor - [ true | false ] - Support the author by putting adf.ly link that redirect on your link. Message - The message that is displayed when you right click on a sign. urltosign.link - Allow you to use /url <url>. urltosign.click - Allow you to click on a sign to view an url. so a little update can handle the plugin better: - a /urlremove command? 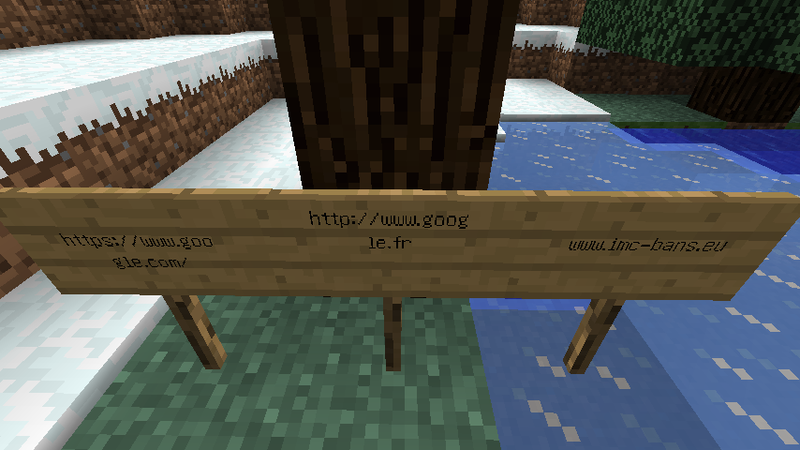 - or remove links from the config, if the sign destroyed. The way to write the link directly on the sign works fine. You can now update to v1.4 ! If you don't want adf.ly, just disable it in the config. Easy to make, but why the hell you add that adf.ly thing? There are many plugins like that without afl.ly exploit so why should I download this ? I see you've changed the description of your plugin. At the time i posted my complaint the description stated there was no config, thus had the impression there was no way to disable it. TO ALL WHO SAY I MAKE MONEY, JUST GO INTO THE CONFIG AND SET "SuportTheAuthor" TO FALSE ! wtf i dont support advertising on my server and using adfly as a way to get money isnt right dude just add the normal urls. DON'T UPDATE TO 1.4 VERSION !! This plugin didn't run with the 1.6.2 Spigot Version. Please update! There should be a permission to be able to use this. Great plugin :) thanks so much! Thanks, have you got a better method ? Nice thought. But this opens browser on whatever machine running server not client.